It’s going to get cooler. 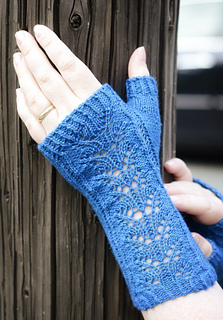 I can’t do anything about that, but these little lacy mitts might be just the thing to make it a bit more bearable. 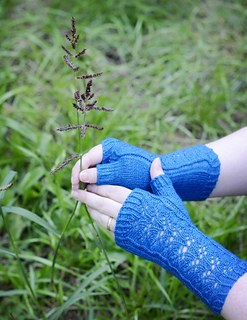 These mitts are perfect for using up leftover bits of sock yarn (or even bits of your hand-spun yarn). They knit up quickly and are a great way to get a head start on your holiday knitting. 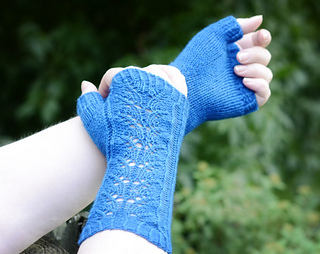 The pattern comes in four sizes (38, 42, 46, and 50 stitch cast on) to fit most anyone. And of course you should feel free to adjust your gauge a bit to fine tune the fit of the sock. Just be sure that you’re working at a gauge that gives you a sturdy sock fabric with your chosen yarn. I recommend working at something around 5.5, 6, or 6.5 stitches per inch, and I’ve included a table to help you figure out what gauge you’ll want to use for the size you need.